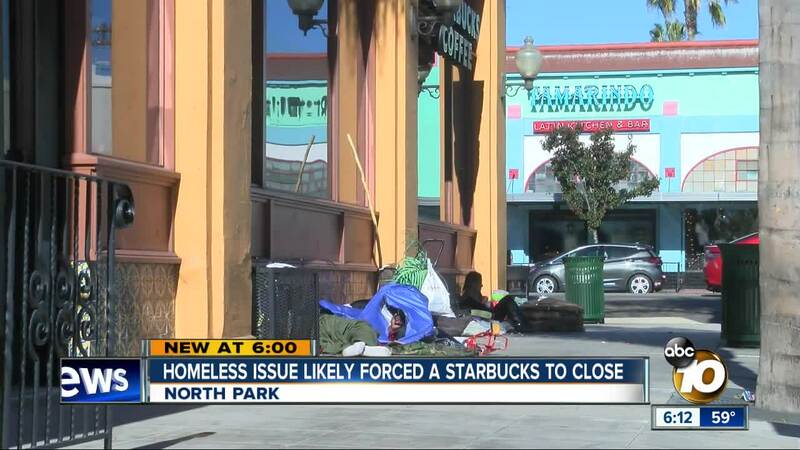 San Diego's homeless crisis is forcing a North Park Starbucks to close, customers say. SAN DIEGO (KGTV) - A Starbucks that played a key role in redeveloping North Park will soon serve its last drink. Carly Clegg is a regular at the Starbucks next to The Observatory North Park. "It's a bummer," said Clegg. The collection of notes posted inside the Starbucks tell the story: Customers bidding farewell to their Starbucks. It will close up for good Saturday. The apparent reason for the closing is one regular Robert Green knows well. Several customers who have asked employees why it's closing have been told an increase in homeless individuals are turning off customers, leading to a decline in sales. "There are people camped out there all day. I noticed an uptick starting about five years ago," said Green. "When I have family and friends that come in, they walk by and say, 'Let's go to another one,'" Clegg added. "You hate for this business to go out with a whimper," said Green. "They stuck out their necks. They were one of the first businesses in. They were a catalyst," said Green. Green says the long morning lines he saw at the Starbucks five years ago have disappeared. He hopes the closure won't be sign of things to come. "A lot of people have put a lot of work and money into this neighborhood ... It makes you wonder who could be affected next," said Green. In a statement, Starbucks says, "... as part of Starbucks standard course of business, we continually evaluate our business to ensure a healthy store portfolio. After careful consideration, we’ve determined it is best to close the store at 2899 University Avenue in San Diego, CA."